Created by Leiji Matsumoto, Captain Harlock is a manga series that got adapted to the television by Toei Animation. It is 2977 AD and mankind has become stagnant. Robots do all the work, the masses are kept tranquil by subliminal messages, and government officials are lazy, caring only about recreational activities like golf and horse racing. Captain Harlock has defied this insipid mentality, leading a group of like-minded rebels to a more adventurous life aboard the spaceship Arcadia. A mysterious force known as the Mazone has invaded the Earth, taking the form of mysterious cloaked women that kill anyone who suspect their nefarious doings, such as Tadashi Daiba who is now on their hit-list. 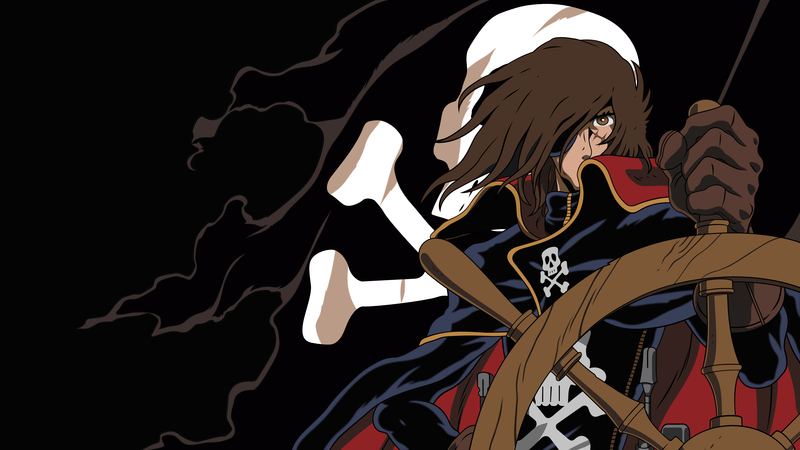 After his scientist father is ignored by the government and killed by the Mazone, he joins Captain Harlock and his ragtag group of pirates to assist them as they try to save humanity from the impending alien threat. I probably remember more thing from Captain Harlock than UFO Robot Grendizer, one scene in particular is when they let go a Mazone they captured and the latter blow-up her own spaceship to kill herself, cause since she were capture by the space pirate she couldn’t return to her people without facing the doubt of treason. They release a movie in 2013,kind of visually similar to Final Fantasy VII: Advent Children still, haven’t watch it yet, so if anyone did let me know.